Betsy is the Family Ministry Director and Westside Initiatives Director. As the Family Ministry Director, Betsy oversees the ministries for birth-5th grade. Her focus is not only to minister to kids on Sunday mornings but also to inspire and equip parents to minister to their kids at home. Betsy loves seeing kids excited to learn about Jesus and helping families take next steps to grow in their faith by encouraging others, loving them and sharing the hope that we have in Jesus Christ. In Betsy’s role as the Westside Initiative Director, she coordinates Homework Buddies, meals at the 2nd Avenue Community Center, Backpack Blessings, and Big Kick Soccer Camp. Betsy grew up in Lexington, NC and then attended UNC-Wilmington where she received her degree in Elementary Education. Before joining the RRC staff , she taught school & preschool and was also a stay at home mom for several years. Betsy is Mom to Noah, Chloe and Mary Taylor. Spending time with her children, friends, and family are what she enjoys most. 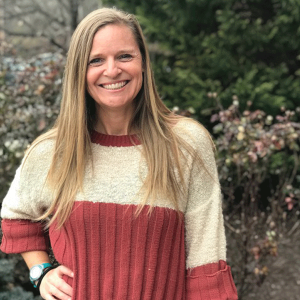 Betsy loves to run and she is also passionate about spending time loving on & serving her many friends in Haiti as she travels there each spring and fall. In the Spring of 2017, Betsy was named by Union Mission as one of their Women on a Mission honorees, being recognized as one who consistently dedicates time, resources, talents, and heart to help others in the community.